Another great Sunday on the water with 31 boats turning out, a big thank you to our RO’s, the dynamic duo of Clem & Wendy McElligott, great job again guys. Sunday the 19th November was a mild, overcast day. The early morning fog had cleared. The wind was very light and variable at first, causing race officers Wendy and Clem McElligott to postpone the start of the third race in the O’Leary Insurances Winter League. The wind soon settled into the southwest, at between 8 and 12knots, and the race could start. The tide had just begun to flood when the fleet of more than 30 boats spread out across the starting line at Corkbeg. The pin end was quite congested at the starting signal, with lots of starboard tack boats and one brave individual on port. It was a beat to the Cage, the first mark on course 95. The light conditions suited Jelly Baby, which tacked west soon after the start. She got to Cage first, followed closely by the 1720s, Heroes and Villains and T-Bone. The next mark was buoy No. 3, out towards Roches Point. To get through the wind shadow under Camden, the fleet split between those who set a spinnaker or asymmetric and sailed low or those who held onto their jib and sailed high. As long as you did not go too high and get stuck in the lull, the latter option seemed to pay. After Camden it was a fetch to No. 3 and a beat to W2 buoy, off Weavers Point. Most of the fleet stayed on starboard tack from No. 3, crossing the tide later. The minority, who tacked early to the western shore, probably lost out a little. 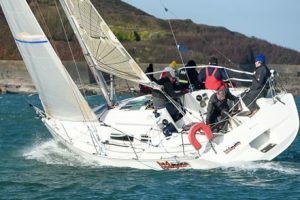 However, in staying on starboard tack one risked a close encounter with that nasty rock ledge, which is steep-sided and projects out from the shore, three quarters of the distance southwards from White Bay beach towards Roches Point. Michael Murphy and crew on Shelly D diverted from the race to assist another competitor, who had gone aground on the rock ledge. Kieran O’Connell, on a Club rib, helped get the boat afloat again. Fortunately, there were no injuries and minimal damage. From W2 it was a run to No. 6 buoy, in the middle of the channel, followed by a reach to Cage and a long run to No. 9 buoy, which is just to the northeast of the Refinery jetty. Jelly Baby had stretched out her lead and rounded No. 9 first, followed by Heroes and Villains and T-Bone. Alpaca, who was white sailing and was doing very well, rounded fourth, ahead of Class 1 and 2 boats carrying spinnakers. No. 5 was the next mark on the course and the fleet beat south along the eastern shore, staying out of the tide. The finish was at Cage. Jelly Baby, Heroes and Villains, T-Bone and Alpaca held onto their positions. On IRC handicap Jelly Baby (Brian Jones) was first, No Excuse (Tom Crosbie) second, Alpaca (Paul and Deirdre Tingle) third and Coracle IV (Kieran Collins) fourth. On ECHO handicap, Alpaca was first, Jelly Bay second NMCI1 Jade (Conor Haughton) third and Heroes and Villains fourth. At this stage, halfway through the league, three races have been sailed in conditions varying from 20+ knots to eight knots or less. No Excuse has been very consistent and is leading on All-In IRC handicap, with a first and two seconds. Coracle IV is second and T-Bone (Tom Durcan and Clive O’Shea) is third. On All-In ECHO handicap, No Excuse is first, Coracle IV is second and Sea Dragon (Frank Caul and John Molloy) is third. See you all next week for week four of the O’Leary Winter Series. Also don’t forget that on the last race of the series there is a requirement for each boat to get into the festive Spirit and there will be a prize for best dressed boat or crew, as well as the usual festive treats after racing in the bar for all.